A historic battle will take place this Saturday September 10th, when the Tennessee Volunteers meet the Virginia Tech Hokies at the Bristol Motor Speedway. For sure the most anticipated game of the season having been 20 years in the making, and it can certainly be considered the best game of NCAA Football week 2 and you can take a look at the latest CFB odds here, the match is scheduled to begin at 8:00pm ET and will be nationally televised by ABC. This will be the first time since 1937 that both teams will meet during the regular season; and to make it even more historic, the game could set a new attendance record of some 150,000 fans, the maximum capacity of the famous Bristol Motor Speedway, home to some of NASCAR’s finest races. Both teams come into this match with a win in week 1, however not all wins are created equal. Tennessee struggled to win against Appalachian State on Thursday night, and only managed to do so in over time when a fluke fumble was recovered in the in zone giving them the winning touchdown. The Volunteers started the season as favorites in the SEC East Division, but something went terribly wrong last Thursday, their offensive line was overpowered by Appalachian State’s defense most of the game which was not expected by anyone including Tennessee. Joshua Dobbs Tennessee’s QB looked out of sync and he didn’t do what he is known to do best, run the ball. Virginia Tech on the other hand had a stellar season start defeating Liberty 36-13, a wonderful welcome gesture to new coach Justin Fuente. Offensively the Hokies looked like a totally different team on Saturday compared to last season, Fuente’s decision to appoint Jerod Evans proved to be a good move. Evans who completed 20 out of 32 passes for a total of 221 yards and four touchdowns, two of them in the last two possessions in the first half was undeniably impressive. His performance was not flawless though, he fumbled twice before he was pulled from the game, when asked he recognized his mistakes and has vowed to work hard to improve. Tennessee has also admitted it needs to make some serious improvements before Saturday’s match against Virginia Tech and they are certainly capable of it. 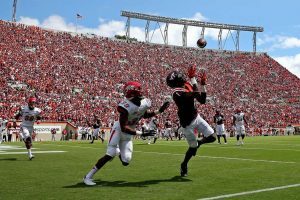 Virginia Tech on the other just needs to make sure their offense is in top shape and perform as well as they did last week, but in order to stop Tennessee they will need to beef up their defense as well. My prediction for this game is that it will be close much closer than some expect. Last week’s unimpressive performance from the Volunteers was a wakeup call for them and I feel this week they will come out swinging in an effort to prove to themselves and their fans that they are still contenders and ultimately they will walk away with the win.